This beautiful 5 star hotel housed in what used to be the old Convent Las Oblatas has recently been refurbished maintaining the original architectural and artistic style. Located a few meters away from the Obradoiro Square, this building is part of the historic part and artistic heritage of Santiago de Compostela. 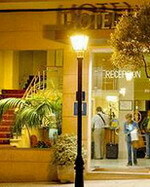 It has maintained the style and the charm of another era, without leaving aside the comfort and services of a hotel. The restaurant offers innovative cuisine, enhanced by its unique location. In a stylish atmosphere, customers enjoy an exquisite balance between traditional Galician cooking and a delicate variety of «haute cuisine» with the individual flair of top chefs. The wine list includes excellent D.O. Spanish wines. The hotel provides a free Fitness Centre, where you will find bodybuilding equipment, exercise benches, Turkish bath, sauna and mini Hi-Fi system, as well as a selection of mineral waters, all offered free of charge. 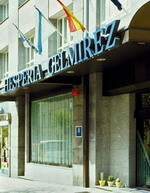 The Hesperia Gelmirez is a modern hotel set in the centre of Santiago de Compostela, two kilometres from the area's popular historical attractions. Those wishing to explore the area are a 15-minute stroll from: the Obradoiro Square, San Martin Pinario, Hostal de los Reyes Católicos, and the Plaza of the Quintana, which are all within two kilometres of the hotel. The hotel's formal restaurant, Gelmirez Restaurant, serves a selection of international dishes alongside regional specialties such as Octopus a Feira and Squid a la Romana; regional wines including Rioja and Albariño are available. Guests on business can make use of the two medium-sized conference rooms, business services and a range of audio-visual equipment. Practical amenities include laundry facilities, breakfast services and a parking garage. In the evening, guests can unwind with a drink or light snack in the hotel bar. The Hesperia Peregrino is a modern hotel with white and glass façade set within the city's new area, 200 metres from the city centre. The lobby area features paved pillars and walls and a sleek wooden reception area. The hotel is within two kilometres of the city's historical attractions: Obradoiro Square, San Martin Pinario (monastery), San Domingo de Bonaval (church), and Plaza de la Quintana. Guests can enjoy a buffet breakfast (fee) in the hotel's breakfast room, which offers views across the pool area. The pool is flanked on one side by lush greenery and is surrounded by sun loungers and parasols; steps lead up from the pool area into the garden where guests can enjoy a quiet stroll or enjoy a refreshing drink on the tables provided. In the evening, guests can dine in the hotel restaurant, Al Punto, which serves a selection of traditional Galician dishes within a sleek, contemporary setting; the hotel's Cafeteria offers hot and cold drinks, and light snacks. 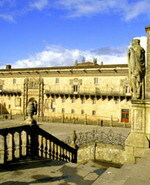 The Hotel Congreso is located in Santiago de Compostela, Spain, five kilometres from the Old Town, a UNESCO World Heritage Centre. Santiago train station is four kilometres away. There is an outdoor seasonal swimming pool, with a separate pool for children. There is also a gym. Wireless Internet access is available throughout, and onsite complimentary parking is offered. A complimentary buffet breakfast is served daily to guests of the Congreso. Local and regional Galician dishes are served at the Orballo restaurant, and the Citania cafeteria offers local and regional tapas. 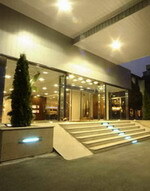 The hotel Congreso offers 15 meeting rooms, the largest of which can accommodate up to 800 persons. The 120 air-conditioned guestrooms are decorated in caramel-and-chocolate tones, with dark wood contemporary furnishings. The Monte Do Gozo hotel and holiday complex is located three kilometers from Santiago de Compostela, on the final stretch of the pilgrimage route at the point where pilgrims catch their first glimpse of Santiago's magnificent Cathedral. Those wishing to explore the area can enjoy a range of sporting and cultural activities organized by the hotel, from horseriding, rafting and quadbiking, to tours of nearby towns and beautiful Galician countryside. A twenty minute walk takes guests to Santiago and the awe-inspiring cathedral.Guests can dine in the onsite self-service restaurant or cafeteria. A wide range of amenities are available including a supermarket, shopping area, library, medical services, meeting rooms and free parking. Entertainment is frequently offered, and guests can relax by one of the swimming pools or by the artificial lake, or take a stroll through the ample 650,000 m2 grounds. San Francisco's Monastery origins date back to 1214, when the Saint of Assisi and his companions made a pilgrimage to Santiago. Gastronomy deserves a special mention in our Hotel. Cuisine is based on the preparation of traditional dishes which feed on excellent products from the sea and from our vegetable garden, with the finest presentation and service. Its wide and varied cellar makes the ideal complement to an offer which includes the best of the Galician cuisine. San Francisco Hotel Monumento in its Orfeón Terra Nosa Cafeteria offers you a wide variety of coffees and teas (Gourmet), not to mention an exquisite selection of alcoholic beverages and cocktails prepared with great skill by our highly specialised personnel. All this within a warm peaceful environment. 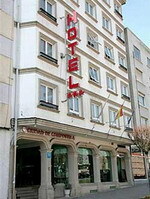 The Hotel San Carlos is located in Sanitago de Compostela, Spain. 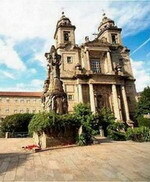 The cathedral is 400 metres away, and Pontevedra is at a 60-kilometre distance. 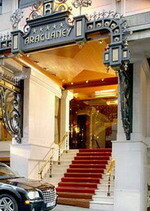 Santiago Airport is 10 kilometres from the hotel, and the train station is 50 metres away. Set opposite the Parliament of Galicia, the Hotel San Carlos occupies a modern property spread over three storeys, which are accessible by elevator, and opens to a lobby area finished with cool marble. The hotel houses a coffee shop and a lounge area, and further amenities include complimentary wireless Internet access, onsite parking (surcharge), and room service. 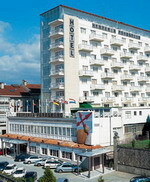 The hotel houses a business corner and meeting space is available. The 21 guestrooms have smart, modern decor with crisp, white linen, and dark wood furnishing. Amenities include air conditioning, complimentary wireless Internet access, satellite television, direct-dial phones, hair dryers, minibars, and safes. The modern Husa Ciudad de Compostela hotel is located in the town centre, one kilometre from Saint Jacques Cathedral, Alameda Parque and Obradoiro Square. Guests can enjoy drinks in the bar and browse the complimentary newspapers in the lobby. The hotel offers public Internet access facilities (surcharge), and guests can ask the concierge for advice on sightseeing opportunities in the area. Multilingual staff at the 24-hour front desk can exchange currency, arrange medical services and look after valuables in the safe-deposit box. Motorists will find garage-parking facilities on site. The 30 light, modern guestrooms are decorated with beige fabrics and simple furnishings. All include cable television, direct-dial phones, Internet connections, minibars, sewing kits and complimentary toiletries. 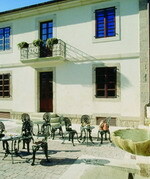 The Husa Universal is located in Santiago de Compostela, Spain, 200 metres from the Santiago de Compostela Cathedral. 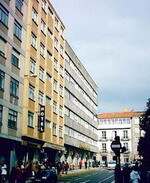 Shopping at Rua Nova is 300 metres from the hotel. Casco Antiguo and the nightclubs and bars of Plaza Roja are 400 metres away. Real Aero Club de Santiago, featuring 18 holes of golf, is 12 kilometres from the hotel. The Husa Universal offers buffet-style breakfasts. A social room with television is on site. Safe-deposit boxes are available at the reception desk. Complimentary newspapers are offered in the lobby. the 54 air-conditioned guestrooms feature dark wooden furniture. Blue-and-white décor adds accent. Each room features a private bathroom with complimentary toiletries. 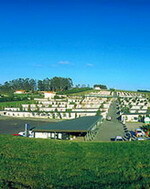 The boutique Melia Araguaney is located in Santiago de Compostela, Spain. The Old Town is 400 metres away, and the gothic cathedral is 800 metres away. Set in the city centre, the Melia Araguaney occupies a modern property spread over six storeys accessible by elevator, and opens to public areas characterised by fresco-painted walls, plush leather seating, and richly patterned rugs. The hotel extends to a seasonal outdoor pool, and houses a health club with fitness room, sauna, and steam room. The multilingual concierge is on hand to provide tourist tips, and those arriving by car will find garage parking available (surcharge). Further amenities include complimentary wireless Internet, 24-hour room service, and laundry facilities. The Melia Araguaney houses the Restaurant Araguaney serving international dishes and the Restaurant Caney offering traditional tapas and Galician specialities. There is an onsite cafeteria. Royal Hospital, late 15th century pilgrims' hostel - Combining history, art and tradition, the goal of pilgrims and the emblem of St. James, the Hostal dos Reis Católicos, in the Plaza do Obradoiro, forms together with the cathedral one of the world’s most remarkable, and most visited, urban settings. The Hostal, which first saw life as a Royal Hospital in 1499 to house the many pilgrims arriving in Santiago, today still invites the traveller to enjoy this universal and fascinating city. Considered the oldest hotel in the world, it is also one of the most luxurious and beautiful. It has four extremely beautiful cloisters, elegant public rooms, spectacular bedrooms and a luxurious dining room offering Galician style fish and meats and the classic apple filloa pies and crème brulee.